You’re using Apache Hadoop and cloud-based data platforms, but can your BI and analytics tools keep up? Can you provide fast, secure, self-service access to all the data business users want? Analyzing big data poses multiple challenges. Highly parallel distributed data architecture is one solution, but until recently it has been mostly limited to databases, not business intelligence (BI) application servers. - What is a distributed BI platform? How is it different from existing BI tools? The accelerating supply of big data is converging with accelerating data demand from everyday business users. What does it take to get from Hadoop as a data reservoir to Hadoop as a day-to-day data source for your business and end users? The answer to ‘what’ is ‘how’ and ‘who’. Reducing architectural reliance on ‘small data’ technologies and broadening access to Hadoop hold the key to big data payoff. Join Nik Rouda, Big Data Analyst and blogger at the Enterprise Strategy Group (ESG), as he hosts this webcast featuring guest presentations from real world practitioners Tanwir Danish, VP of Product Development at Marketshare (acquired by Neustar) and Rajiv Synghal, Chief Architect, Big Data Strategy at Kaiser Permanente. 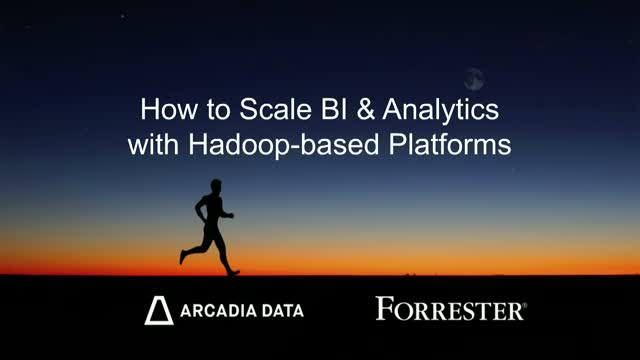 Arcadia Data builds the industry’s only Unified Visual Analytics and BI Platform for big data. We were founded with the singular mission to connect business users to Hadoop. The Arcadia Converged Analytics Platform™ unifies visual exploration and back-end data analytics in one integrated enterprise platform that runs natively on your Hadoop cluster. We converge the visual, analytics and data layers to provide accelerated access to all of the data stored within Hadoop, and support net-new analytics on granular datasets. Our world-class team from Aster Data, Teradata, 3PAR and IBM has a history of developing stellar products in the big data, analytics, and BI spaces. Arcadia Instant is a downloadable version of the visual analytics component of our product used by a growing user community. Arcadia Enterprise is our flagship product deployed by some of the world’s most data intensive companies such as P&G, HP, MarketShare and Appboy. We have multiple production customers within the Fortune 200, with two customers using our platform to analyze more than 100B rows stored in Hadoop.